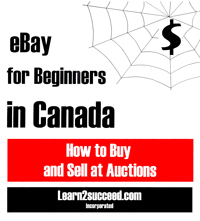 This timely book will help every Canadian who wants to buy and sell on eBay. It covers issues specific to Canada (unlike most other books which are written for Americans). Selling on eBay is probably one of the easiest ways for you to earn extra income, yet many people do not know how to go about it. This book will provide you with the basic knowledge to get started with a very small investment. It will show you how to locate products to sell on eBay, conduct your own research on them, list them and create great images. It reviews some of the computer software that will help you edit your images. This book shows you how to get paid and covers some of the issues facing Canadians especially with respect to US cross-border sales. How to ship products using Canada Post, UPS and others and some of the problems you will face. Learn how to calculate your profit margins and how much money you can reasonably expect to make. Since buying and selling on eBay requires a knowledge of computers, there are chapters to help you select the right computer hardware and your options for connections to the Internet. Read reviews of some software packages to help you manage your eBay auctions. Find out about the importance of the "About Me" page and what is involved in starting your own eBay store. How to keep your customers happy and get repeat business. This book will provide you with the basic knowledge you need to start selling on eBay and where to obtain further information. INTRODUCTION: Welcome to the World’s Largest Auction! Chapter 1 - What Can You Buy or Sell on eBay? Chapter 5 - For What Price Do You Bid or Ask?